Your Thoughts: The Muppets Season 1 Episode 13 - Got Silk? Discussion in 'Muppet Headlines' started by Phillip, Feb 16, 2016. 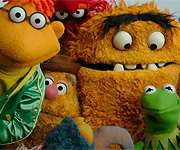 What did you think of "The Muppets" episode "Got Silk"? Absolutely positively! This episode was great! Bork bork! This episode was good. Mee mee. This episode was so-so. You're all weirdos! This episode was disappointing. The ratings are the same as last week, so really bad, meh I could see ABC renewing it to save face or something or because of Disney synergy. Sheesh though this reboot isn't doing me any good, I just don't see how they made the show better, in fact I would say they ruined it. Also no Fozzie or Rowlf or other main characters just stuck in the background, I really hope we get to see Fozzie do something before the end of the season. LaRanaRene and Muppy like this. They are expanding on the Gonzo and Camilla plot in next week's episode. To quote a famous frog (Or Rowan Blanchard/Riley Matthews) "YAAAAAAAAAY!!!" I liked it, but not as much as last week's episode. I liked the B plot with Gonzo, Rizzo and Pepe better than the A plot. I don't think I'm the only one when I say this, I really don't like Pache. He's annoying and a bit of a villain. He's got to go. I'm not a Rupaul fan, but the scenes with him and the fashion show were great! I'm surprised that Miss Piggy figured out that she was very hard to like. From the looks of this episode, it looks like they're trying to change that. The moment where Miss Piggy sings and looks at Uncle Deadly during the song, that was pretty touching. And Deadly on the "Clueless" play, that was priceless! Pepe at the end was pretty funny. Hey did anyone else notice Kermit nervously clicking his pen with his thumb during his voice message to Denise? Crikey, that was subtle! I know! I love when they do subtle things like that with puppets! I feel like the only person here who can't stand pepe. he's a pervert,a jerk, and givers me the creeps. why does he get so much screentime? I'd rather see chip more than him and chip SCARES me! I know right , he is like the guy at the night club who annoys you , the whole time that you are there. and don't get me started on Rizzo, I so wanted to smack him , after what he did to scooter's car. and showed no remorse for what he did. scooter should have took him to court for that. Pepe can be funny at times; he's always thought of himself as a casanova, it's part of his personality, and ironically, there's something funny about puppet characters hitting on ladies: believe me, that was something that was given to my signature character and it's a facet of his personality that just stuck because people actually found it funny. Now, if the writers are intentionally making him more of a straight-up "covert pervert" as it were in yet another attempt to make the show intentionally "edgy" and "adult," then I can see where the problem would be; I don't particularly care that his official character bio says he impregnated one of his past girlfriends. And when you think about, Bill's just really good at playing those kind of egotistical jerks. Johnny Fiama's another one of those characters: he's not always nice to Sal, he tends to be full of himself, but he's still a funny character for those very reasons. Yeah also Bill's really good at performing lovable idiots like Johnny, Bobo, Clueless. Ever notice certain performers are just able to tap into certain characters like that? Like how Joey usually performed adorkable neurotics, or Kevin performing hip, cool dudes, or even with Richard and his flamboyant yet animated maniacs. But pepe gets too much screen time. he ALWAYS seems to have a big part in an episode even though there are plenty of muppets that need love. As for bobo; bobo is likeable and adorable. I love him. I just NEVER really lied pep from the very start. I always thought of him as this annoying little jerk. sure he does have a FEW times where he's actually thinking about others but... bleh. they just need to tone him down or make him a background character for once. Every time I see pep I wanna crush him under something or punch him in the face. Why not have a plotline about Big Mean Carl? Eh,Carl's a bit of a one note character. Pepe, I think needs a good scene partner to be funny. Back in those Toyota commercials wasn't he paired with Kermit in one? And then it was Rizzo and Rowlf in the other? Pepe can be effective with Rizzo. I think the Sean Penn/champagne exchange was hysterical. I wonder if they get paired so often because it is much easier to frame the shots with the two smaller characters together? But too much of them together gets monotonous. Both characters are to some extent "players" and it can escalate too quickly. They should try pairing Pepe in a scene with an opposite character like Sam. Sam could be giving network notes to Pepe for example. Also Pepe gives Bill a chance to do some improvising. "I am Barrack Obama. I can have whatever I want for dinner." is also a very funny line. Bobo would be delightful in a subplot. He had a bit of one with the cookies, but he could handle some more development. He's mentioned a wife and a daughter. I suspect he is a pretty decent husband and father. That may not lead itself to comedy gold, but maybe Bobo could lead one of the studio tours mentioned by Alinda. School group on tour Bobo as the guide. The jokes write themselves. Actually they do not which is why the show has writers. I'd give Carl one and a half notes. But I do think he is best served by the writers revealing only little tidbits about him. "I'm the youngest of nine!" And his aborted talking head in the first episode where he started talking about his father and the cameraman chases after Kermit and Piggy. Duke Remington and scooterfan360 like this. Does anyone think Pache will get his ultimate "come-Muppet-ance" (get it?) sometime by the end of the season. How much of Pache's "suggestions" will the gang take before saying "enough is enough"? Also...loved the bit of Denise leaving a box of Kermit's stuff on his desk--a classic breakup trope. Who thinks that it's the nail in the coffin of Kermit and Denise's relationship? What would have been the point of creating the character and building a puppet for it if they were going to get rid of it anyway? UGH! What's wrong with these people? 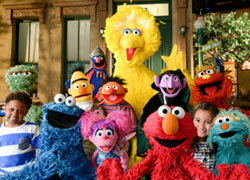 Why can't they give the Muppets great ratings? I know I said this before, but if the Muppets can't get the ratings that big, they'll never get renewed and the Muppets will fade away and it'll be all peoples fault. Or better yet, it's One Million Moms fault! I wasn't saying that. I was just saying it was the end of Denise's relationship with Kermit. I'm on your side in wanting to see Denise on the show again. Then again...who will Denise hook up with in order to mess with Kermit's head in an act of revenge? Link? Sorry for not replying back about a week ago, but I just got back from vacation so I'm ready to get back to reviewing recent Muppet episodes! I felt pretty bad for Piggy when she felt she had no friends since the show changed and everyone else is making some plans without her. It was nice for Uncle Deadly to stick by her whenever things were tough, especially with his take on Clueless, which I thought was pretty funny. Janice was really nice to take Piggy to her silk class, and I saw how that turn out. I also thought it was a very sweet ending with Piggy and Ingrid Michaelson singing "The Way I Am." The Pache storyline continues with him making Gonzo, Rizzo, and Pepe fall under his spell with suits really made me more distrustful of him. To me, he's just a wily one. I thought it was pretty cool the guys used RuPaul against him for the fashion show bit, and Pache took the check for the wardrobe even though he was pretty miffed at Kermit for foiling his plans once again. For me, good ol' Karma. Also, I feel pretty bad for Kermit since the incident with Denise, when I saw the box filled with items returned from her and she hasn't returned his calls. Sounds like another broken relationship is on the line on this show. Now all that's left is Kermit to decide who he cares about most: Piggy or Denise? Guess that's something us fans and the Muppets to decide, too. So far, another good episode. So is Pache a boss to Kermit or not? At first I thought he was one of Kermit's bosses (after all, his boss did hire Pache to help with the show), but Kermit does tell him that he's the one who's in charge of the show (even if they are equals, as Pache says). In fact, I sort of thought it was odd how in Swine Song Kermit didn't go with any of Pache's ideas, and thought it was odd that he would sabotage the show just because Kermit didn't. But if he's not in charge of the show, and doesn't have an in-charge role, then I guess it doesn't really matter to him if the show fails. Is it just me, or has the show been inconsistent about whether Rizzo and Yolanda are a couple? They do go on a date in the first episode, and I feel like there's another episode where they were shown to be together (can't remember for sure what I'm thinking of), but here Rizzo is happy that she's noticed him, and Kermit remarks that she normally reports Rizzo to HR, which would imply a one-sided attraction from Rizzo.